Quest for Glory is a series of hybrid adventure/role-playing video games. The first in the 5 part series tells the tale that: In the valley barony of Spielburg, the evil ogress Baba Yaga has cursed the land and the baron who tried to drive her off. His children have disappeared, while the land is ravaged by monsters and brigands. Given the choice of 3 different classes it's the player job to save the day and now is the time so click away! Best Single-segment Time with Fighter: 0:09:27 by Paul 'The Reverend' Miller on 2015-06-14. Best Single-segment Time with Magic-User: 0:10:29 by Paul 'The Reverend' Miller on 2014-01-29. Best Single-segment Time with Thief: 0:09:16 by Paul 'The Reverend' Miller on 2015-02-23. Best Single-segment Time with Large-skip glitches: 0:03:43 by Paul 'The Reverend' Miller on 2016-12-04. Best Single-segment Time with Thief: 0:05:32 by Paul 'The Reverend' Miller on 2015-10-16. Best Single-segment Time with Fighter: 0:05:35 by Paul 'The Reverend' Miller on 2015-10-14. Best Single-segment Time with Magic-User, Large-skip glitches: 0:01:35 by Paul 'The Reverend' Miller on 2016-12-04. This run was done on the GOG.com release of the game, with a few settings changed to the DOSBox configuartion. As previously agreed on in my other accepted runs, the configuration file changes XMS and EMS to false to prevent unavoidable crashes which would not allow for single-segment. The video output from "Overlay" to "OpenGL" to allow for FRAPS to make the recording. I want to thank Crow! for his advice on a route/strategy change after my first rejected Fighter submission to SDA. Also, as a minister, I have to give credit to God for giving me a little extra leisure time to practice the series of games I enjoy. Points allocation in character creation emphasizes magic, throwing and weapon skill. The reason for this is a dependency on throwing, rather than climbing or magic, to do the two major events in the game: the Spirea Plants, and the Bear. More in those specific areas. Magic is used for Open as well as Calm. Weapon Skill allows you to hit the bear consistently and end the fight almost immediately (without dying to stamina loss). After I gain control, of the character, I switch the Speed to HIGH. Not changing Detail to low saves a little time. I set movement to Run for obvious speed reasons. I purchase Open spell from Zara's shop, and then head over to the General Store to get two flasks. Using the TAB key to open the inventory, I am able to get the money pouch ready to purchase which saves a few extra seconds in the Magic Shop. Clicking the hand twice on the door to the General Shop avoids dialog with the centaur. If you collect Rocks outside of the Potion Shop, they collect fast. I am specifically picking up 14 times for a reason. First, it pretty much guarantees my Throwing skill to be strong enough to get the Spirea Seed on the first try everytime. Second, it brings the bear down to one or two hits with the sword. Really, you only need to pick up 11 times, but 14 gives you a buffer to make sure you do not step right into the bear and end the game. Picking up 14 makes it so that I get the "you-are-no-longer-overweight" dialog which is my cue to attack. It is a safety-strat that only costs about two seconds at best. You can kill the bear with less throws, but you almost guarantee you will build your Agility to over 25 which makes the Faerie Circle do the "slow" version of the dance. Even then, the 25 Agility ceiling is tight enough using this strat that sometimes you end up with a "slow" dance anyway. I head to Erana's Peace to get Calm and the Flowers. Killing the bear was originally my wife's idea, as stated in the Credit section. The major change here is that rather than using potions acquired through returning the Ring, I rest for 30 minutes to give myself just enough Stamina to kill the bear (thanks, Crow! ), then run immediately out to get the Spirea seed, and make sure I hear the phrase for the Ogre's Cave. The seeds are still the biggest troll of the entire game for speedrunning, and continue to give me nightmares, but it worked out fairly nice here. It seems like you must see the Seed spit once before you can target it with a Rock, and even then, the character only throws the rock on certain cycles. I rest for 60 minutes, and head to the Stables to kill more time and Stamina to be able to rest again. One more 60 minute rest makes it night. I immediate run to the Meeps and get the Green Fur next. I rest 60 minutes just as I reach them and the game transitions to night. This allows me to get the Fairy Dust, which shows off the "fast" version of the dance. By waiting until night, you do not have to chase the White Stag to get to the Dryad either. I sleep by the Dryad's tree to skip to the next day, but I move closer to the tree when I do so that when I awake, the Dryad scene immediately fires and gives me the next ingredient for the Dispel Potion. After getting the last ingredient (Flying Water), I head to the Potion Shop to make the Dispel Potion. I run down to the Antwerp and cast Open to reveal/open the lock on the secret door. This door is a little frustrating on the RNG as well, but not nearly as bad as the Spirea Plants. Clicking the mouth icon on the character/door uses the secret phrase to allow you into the Cave. I rest for 60 minutes in here, thinking I will not have enough Magic Points which is incorrect. It is a reflex from running the "major skips" category which does require a rest. It does not eat up more than two or three seconds. The fact that there was no RNG encounters in the run MORE than makes up for it. I cast Calm on the Minotaur, head for the door casting Open on the way. This section is pretty straight forward. You have to wait for specific moments or else the room will kill you, and you MUST wait for chandelier to fall on the Stooges to open the door. Not waiting results in a Game Over. This went so smooth; I am happy with this Yorick's Room. Using TAB is much faster to get out the Dispel Potion, and there is no reason to switch to running to exit the room. Switching to run actually costs about a second more because of the menus than simply walking the short distance to the end of the game. Better input, optimization of time/agility/throwing/stamina management of the bear fight, and a bit more speed on the Spirea Seed, but with no RNG encounters of any kind in this run, those might amount to ten seconds or so. This run was done on the GOG.com release of the game, with a few settings changed to the DOSBox configuartion. It has come to my attention that changing the memory information and adding one line to the code prevents pretty much all of the "out of handles" crashing glitches. XMS=false. EMS=false. One of these two changes (maybe both) fixes so many of the crashes. I want to thank Crow! for sharing the information with me and for Puri_puri for teaching him. Also, the video output from "Overlay" to "OpenGL" to allow for FRAPS to make the recording. I have been in touch with the person who configured the DOSBox package for GOG.com, and he is going to be looking into why the "out of handles" glitches happen. This game expects a regular amount of save/load, which naturally eliminates many of these crashes. In particular, I encountered a 100% consistent crash when moving from the Brigand's Cafeteria to Yorick's Maze, which crashed the game with this "out of handles" error.An immediate save/load in the Brigand's Cafeteria fixes this, but looks clunky/"like a safe-strat" in a short single-segment run which isn't necessary. And while I haven't asked them officially, I can say these crashes are definitely NOT what the Cory and Lori Cole wanted to see in their finished game. I want to thank Crow! for his advice on speed-ups after my first accepted submission to SDA. I went back to attempting runs with all three characters again, and grinded all day to make it happen. His suggestions (specifically, the use of the TAB key) are what made this and other new optimizations possible. Also, his suggestions on optimizing Fetch skill gain, which is something I initially thought was not feasible given the ridiculous inconsistency of the skill gains in magic. Points allocation in character creation emphasizes magic and stealth. That extra five points in Magic is so, so, so important. After I gain control, of the character, I switch the Speed to HIGH. Not changing Detail to low saves a little time. I set movement to Run for obvious speed reasons. The only thing I will do here is get the Open spell from Zara's shop; nothing else. Using the TAB key to open the inventory, I am able to get the money pouch ready to purchase which saves a few extra seconds. Getting the Flowers and Calm goes straight forward. Of special note, I use the time I am switching to 'run' after leaving the garden to take a 30 minute rest. This is so important. Resting and time management in this run is hardest of all. After stealthing my character to the Key, I use the Open spell to force the secret chest open, and go for what Crow! called the "chest dive" (I love that term). I get the coins, and get out before the Kobold can hit me with a single spell. This money is necessary for the Fetch spell and Mana Potions, and prevents the need to farm mushrooms. I free the bear, and immediately head down to Brigands to hear the secret cave phrase. I head back into town to buy the Fetch Spell with my new-found Kobold loot, and head to the Potion Shop to get the Ring. For some reason unknown (at least to me), there are random times where casting Fetch results in a double-casting of the spell. My goal is to cast the spell four times, go in, buy three Mana Potions after trading in the Ring, and come back out and get an additional eleven casts in. This is an attempt to maximize my Fetch spell skill to get the Spirea Seed... if a double-cast happens in here, it causes me to run out of mana faster. You get double skills gains sometimes, but it is, again, RNG based. Also, you cannot tell the difference of when it happens, and you may run out of mana with nothing left to resort to. I get my eleven casts off, PRAYING that my Fetch skill is high enough to get the Spirea Seed. Also note, I rested for THIRTY minutes instead of sixty. This is so, so, so important, and I will explain why in a second. I head to do the stable work, and then exit to the Spirea Seed. You can technically rest for 60 minutes rather than 30, and it theorhetically could work, but when you leave the Stable, depending on the RNG time-gods, you make it to the Spirea Plant just as it begins to transition to night. If you cast Fetch, it false-locks the game because the plants will not spit the seeds at night. I call it a "false-lock" because you can, technically, wait until morning and the seeds will start up again. As this would take somewhere in the 20 minute range, it DID result in a restart in a previous attempt that showed promise. As I get to the Spirea Plant, somewhere in the last round of Fetch casts, I had a double-cast glitch. It said I was out of mana, and having come this far, I took the risk and did a 30 minute rest PRAYING it did not turn to night. It amazingly worked... but then, I had another fear; was it still TOO early, and had I wasted my rests? I run to the Meeps, and hope to see the screen transition to night as I travel or talk to them. No such luck, and I realize this might just be the end of the attempt. I give it a shot, and attempt to rest for 30 minutes, and I have no reason for why it worked. But it did, and I realized this was probably going to be the run that made it happen; I just had to hope I got the "fast faerie" dance, which I did... This is now the home stretch. By waiting until night, you do not have to chase the White Stag to get to the Dryad. I sleep by the Dryad's tree to skip to the next day, but I move closer to the tree when I do so that when I awake, the Dryad scene immediately fires and gives me the next ingredient for the Dispel Potion. Everything else has been going fantastic, and I am well ahead of my personal best. I then head to the Potion Shop to make the Dispel Potion. This section is much more consistent now that I have the TAB strategy. There is a random encounter that I run into, but escape quickly enough that I decide not to sweat the four or so seconds it costs, given the EXTREME amount of frustration this route has caused me. I run down to the Antwerp and cast Open to reveal/open the lock on the secret door. This door is a little frustrating on the RNG, but goes smoothly enough. Clicking the mouth icon on the character/door uses the secret phrase to allow you into the Cave. I cast Calm on the Minotaur, head for the door casting Open on the way. This area has been much improved since my previous Thief run. In particular is my use of the NUMPAD to move the character out of particular areas, rather than relying on the mouse. I do run into a little bit of trouble getting to the second door, but as this is the end of a very long battle with this route, I am happy enough. Using TAB is much faster to get out the Dispel Potion, and there is no reason to switch to running to exit the room. Switching to run actually costs about a second more because of the menus than simply walking the short distance to the end of the game. Good luck. I mean it; find another route, because this one will only stress you out restart after restart. This run should be in the 10:21 range if I understand SDA timing rules, and I hope if/when it is beaten, it looks nothing like this route. God-save the poor soul who goes through it. I want to thank Crow! for his advice on speed-ups after my first accepted submission to SDA. I went back to attempting runs with all three characters again, and grinded all day to make it happen. His suggestions (specifically, the use of the TAB key) are what made this and other new optimizations possible. After reworking all three classes, I saved the Thief for the last one to try again simply because it is the most consistent of the three classes. Thought the Spirea Plants may kill individual runs, I should never run into a situation where I die or run out of time, which makes this run a bit less intense. Points allocation in character creation emphasizes magic, stealth and a little extra to strength. The extra points to strength make for much more consistent opening of the door to the Troll's Cave, which was an area that could eat a few seconds with bad RNG, without sacrificing time on climbing which builds fast enough. After I gain control, of the character, I switch the Speed to HIGH. Not changing Detail to low saves a little time. I set movement to Run for obvious speed reasons. Using the TAB key to open the inventory, I am able to get the money pouch ready to purchase which saves a few extra seconds. In the General Store, I buy two flasks. Rather than using TAB in here, I find it faster to use the top bar which already has the money pouch ready to go from my previous purchase. In the back alley, I am training climbing, which is a little inconsistent but not terrible to restart on since it is very early. I am looking for the "exhausted" dialog to pop past and to go a little beyond before climbing. That is pretty consistent to climb up to the Spirea Plants. After climbing the wall, I immediate run north to avoid an extra dialog from the centaur. If you run to the left, you can't go fast enough to miss the dialog box, but north is a shorter route. I then head for the Spirea Plants, which is a bit different from my other runs. I climb and get the Seed, which is within a second or two of perfect RNG, and head east and north to get the Erana's Peace. Before reaching it, I rest for 30 minutes. If I do not immediately have an RNG encounter when travelling east/west, it means that there is no enemy encounter that will appear, so it is safe to rest. The same cannot be said for north/south, which will still have the enemies appear from the east/west only slower. To avoid RNG encounters, north/south is safer. To rest while running, east/west is safer, because the sleep box will be grayed out if there is an encounter. Getting the Flowers and Calm goes straight forward. After stealthing my character to the Key, I free the bear using a pretty optimized series of movements, and head down to the Brigands; followed by a 60 minute rest and the stables to chew up more time/stamina. By waiting until night, you do not have to chase the White Stag to get to the Dryad. I sleep by the Dryad's tree to skip to the next day, but I move closer to the tree when I do so that when I awake, the Dryad scene immediately fires and gives me the next ingredient for the Dispel Potion. I have one random encounter on the way to the waterfall, and because I know the NumPad keys to get out of combat quickly now, I escape almost immediately. After getting the water, I head to the Potion Shop to make the Dispel Potion. This section is much more consistent now that I have the TAB strategy. No more random encounters. I run down to the Antwerp and cast Open to reveal/open the lock on the secret door. The door opens about as quickly as I could ever hope. Clicking the mouth icon on the character/door uses the secret phrase to allow you into the troll cave. I cast Calm on the Minotaur, head for the door casting Open on the way. The Fort is just matter of precise clicking, and not really difficult (though it has cost me a few runs in the past). This area has been much improved since my previous Thief run. In particular is my use of the NUMPAD to move the character out of particular areas, rather than relying on the mouse. I am not sure I can get this room to go more than second or two faster, and am pleased as heck with it. Better RNG with encounters, Spirea Plants and the rock door, and even then, they are pretty consistent. Past that, this run is about as solid as I could ever expect to get. Sub 9-minute is certainly possible, but it would take quite a bit of RNG grinding to make happen. Even then, it would be tight. 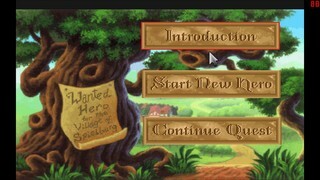 This is run from the GOG.com version, which sets DOSBox to a fixed 10,000 cycles. The only change to the DOSBox configuration file is to output to OpenGL instead of Overlay to allow Fraps to record, and a sound setting to emulate the superior Roland MT-32 soundtrack. Of course, I want to thank SDA for hosting such a great service. It is always my first place to check for speed runs, and the community is always super friendly and helpful. c-square over at TASVideos for finding some new tactics in the EGA version that lead to me investigating this version for a similar method. Timing starts when the sheriff just after the mouse transition to control after the sheriff says "Good Luck" and ends when the hero hits the door transition to escape the Brigand Leader's room. The room after that is in effect a credits screen where you can investigate all of the development team, but otherwise, serves no gameplay purpose. Finally, as a minister, I have to give credit to God for giving me a little extra leisure time to practice the series of games I enjoy. The Kobold and freeing the Baronet is still required in this version, and I don't see that changing anytime soon. 35 Stealth is required to get the key from the Kobold, which triggers the scene that lets you see Bruno and the Brigand talking to learn the password for the Troll Cave. Magic is used for the Open spell. The extra into Strength speeds up when to rock door to the Troll Cave opens up, which happens around 40 Strength. This section is heavy on mouse and keyboard movement controls, and very RNG heavy in the forest. Pressing the 'Insert' key switches the mouse between the 'Move' icon and whatever icon you were previously using. 'Tab' opens the inventory. Getting the Open spell from the magic shop is not strictly necessary anymore, but is still faster/safer. I'll talk about why later. I head out of town once I have the Open spell, free the bear from the Kobold, and watch the scene between the Brigand and Bruno to learn the password. Of interest is the fact that you do not need the Open spell if you pick the Thief. Theorhetically, you could pool almost all of your points at the start into Pick Locks, and open the rock door that way. Unfortunately, there is a very real risk of dying because of over-exerting yourself. Open is the safe and still faster way because there is an RNG component involving a small amount of grinding of Stealth to make up for the increased amount of lock picking. In the Thief 100% run I am working on, Open has been eliminated entirely now and magic is no longer needed because of the upcoming glitch, which skips the Minotaur. I'm not entirely sure how it works, but it was discovered thanks to the Minotaur skip in the EGA version. The EGA skip works differently, and involves just running past the Minotaur in a particular way. But because that skip existed, I came back to this one to see if a comperable way could be found. You have to manually move out into the open with sneaking, but not too far, and then click on the door and then the fence to attempt to climb over it JUST as the minotaur has noticed you. You can graphically see something gets screwed up, and the hero heads back in front of the door and is suddenly through it into the next screen. Nothing in the rest of the run has changed, and it just has to be managed quickly. Throwing a dagger in the Brigand Leader's room unlocks the character which allows for a quick exit to the end-game screen. Since Calm is no longer necessary, this run is only going to get better by a newly discovered skip or better handling. Both are possible. Skipping the Brigand's Cafeteria would be awesome, but I haven't found a way to make that happen despite many, many attempts. My suggested time is 3m 43s, and while there is probably a couple seconds to be shaved off with better handling, this route went extremely well. The biggest change is that this new glitch will make its way into the 100% Thief run and the Marathon Any%. Even if you do not have Calm when exporting your character from this route, you start QFG2 (both versions) with Calm as if you had acquired it. It is a little strange, because other spells do not do this. All of the purchasable spells (Flame, Open and Fetch) are skippable and do not appear in QFG2 if you import, and Detect Magic, Dazzle and Trigger are all skippable but purchasable in QFG2. Calm appears to the ONLY spell that is an automatic gimme for importing purposes. This is run on the official GOG.com settings, which sets DOSBox to a fixed 10,000 cycles. Actually, it is the GOG.com DOSBox configuration files, but run on an older version of the game. This run was done on version 1.00 of the game, which was known as Hero's Quest I. It was later changed to Quest for Glory by Sierra in subsequent versions and on through the series due to a copyright issue. The GOG.com release is version 1.20. The only change to the DOSBox configuration file is to output to OpenGL instead of Overlay to allow Fraps to record. The reason it is run on version 1.00 is because there is a specific exploit that eliminates having to save the Baronet and allows immediate safe entry into the final area of the game. This knocks off a good two minutes or so which is explain in detail below. Renault's 2007 run was the major inspiration to running this game, and the completion and acceptance of the other categories made me want to finish out the cycle. I was thrilled when I first saw Renault's run, but was disappointed as very few people ever went back to try and improve on it despite it being a fantastic game. After trying to duplicate his attempt, I realized his keyboard skills far outpaced my own and shelved the idea for the VGA version. Once the VGA runs were done, it was a matter of taking what I had learned and applying it to the earlier version, as there were a number of optimizations discovered. Running the VGA version and routing that one adjusting the route for this EGA version very easy. There are a number of differences between this and the VGA remake done by Sierra a few years later, and where those places occur I will mention it through the scene by scene commentary. I feel that this is the fastest route barring the discovery of a newer glitch or a way to avoid the Fort to transition to night. The major differences in class routes have to do with saving the Baronet, and since this is not done at all, this poses a different kind of problem with the different classes. The Thief spends points to get 5 Magic, raises Climbing to 35 and leaves 5 extra points once this is done (usually for Strength). The Magic-User spends points to get 35 Climbing (he already has magic) and leaves 5 points once this is done (usually for Strength). Because their skills are identical for purposes of the route, what is done with the Thief can be done with the Magic-User with absolutely no difference in action. It would be boring to submit an identical run to this with the Magic-User. The only difference in route is with the Fighter, who does not have enough starting skill points to get both Magic and Climbing. This is easily fixed by spending points on Throwing instead, but that changes the opening route slightly as he cannot climb over the back-alley wall. However, once the Fighter gets some Rocks and easily obtains the Spirea Seed with his 45 Throwing skill, the route merges and becomes identical from there at about the 1:00 to 1:30 mark. This may end up being about as fast because of the RNG of Strength and the door to Troll's Cave, because the Fighter takes less time about 90% of the time. The difference in time is likely only about a maximum 20-30 seconds, and even that might be less. This is strictly a version 1.00 problem because you can skip saving the Baronet only in this version. Points allocation in character creation emphasizes magic, climbing and a little extra to strength. The extra points to strength make for much more consistent opening of the door to the Troll's Cave, which was an area that could eat a few seconds with bad RNG. Climbing 35 is entirely for collecting the Spirea seed. Climbing 30 occasionally does not always work on the Spirea Seed cliffs, but Climbing 35 is 100% safe. Magic is for the Open spell and the Calm spell. I begin by pressing the + button on the keyboard to max the game speed. Once I gain control of the actual character, I buy the Open spell by heading to the left of the screen and then over to the General Store to buy two flasks (one for Fairy Dust and the second for the Flying Water). I head into the tavern to get thrown out twice. This changes the time to "sunset." I guess the idea is that when you make Crusher the Bouncer mad, he roughs you up for a while before throwing you out on the front door. This is key. In later versions, you need to save Baronet before noon to hear the password for the secret cave. Since the early part of the day is no longer necessary, the only thing I need daylight for after my purchases is to catch the Spirea Seed. The plants don't spit at night. Another difference between this and the VGA version is this back-alley wall. While this is still the best place to train, after a few attempts at climbing the wall the game will tell you that you are going to attract unwanted attention if you continue trying. You have to exit and re-enter that screen with takes about a half of a second and then you can make another 2-5 attempts before you have to reset the screen again. The number of attempts you can make before you have to re-enter the screen is random, from what I can tell. That does not happen in the VGA version, and the wall is the best early place to train because of it. With my Climbing skill at 35, it is just the fastest way out of the town for my next destination. The next obvious difference between the EGA and VGA versions is the use of keyboard for almost all movements. The screens north/south and east/west don't always line up right, so getting caught on bushes is common. It is almost always quickly fixed. It's more difficult with doors, but at least with the doors there isn't the constant threat of RNG encounters with monsters. They are far more frequent in the EGA version, and nearly impossible to avoid when the game speed is turned up to the highest. Luckily, there are no encounters, although you do get to see a goblin chase me. I reach the plants, climb up and immediately press the up key which activates catching for some reason. This is pretty much perfect RNG. Getting the Flowers and Calm goes straight forward, with a little bit of keyboard frustration. The next thing is to transition to night. When you type "rest" it only advances 10 minutes at a time. In the VGA version, you have the option to rest for 60 minutes at a time. This makes resting in the EGA version tedious, but also has the unfortunate side-effect of not allowing enough time to pass for night to actually start. Luckily, the stables scene can skipped by simply pressing enter again after agreeing to work. I run to the Meeps through the special goblin arena, because that elimiates a few screens for bad RNG encounters. The Meeps give me the fur, the Faeries give me the dust, and I sleep at the Dryad's Tree and get the Acorn. Running straight east, I get the Flying Water and head north and get the Dispel Potion. Fast and uneventful. Once I reach the Antwerp and the secret entrance to the Brigand's Fort, you have to position yourself VERY specifically to find the keyhole. I have no idea why it is so specific, but once you find the keyhole it is a matter of unlocking the door with the Open spell and forcing the door with Strength. You build strength with every attempt and do not lose stamina. The exact strength needed to open the door seems to be RNG affected, either by how much you randomly gain with each attempt or whether or not it actually opens. This was great RNG, by my estimation. The biggest time saver is here, where I type "hiden goseke," which is the password that I shouldn't know because I never listened to the Brigands after saving the Baronet (because I never did). This only works in version 1.00, and was patched out in every other version I tried. I cast Calm immediately to prevent the Minotaur from moving too far to the right. He just travels back across to the rock to sleep, so the closer he is to it, the faster you can get to the next action. Cast Open, open the gate and enter the Fort. The Fort area goes quick. This section is pretty straight forward, with little difference from the VGA. The triggers for each event are pretty specific, and when the game speed is turned up, you do not really have to wait between the next actions in the text-parser. You also do not have to wait for the chandelier to fall on the Stooges like in the VGA version. This area is dangerous at this high of a game speed. In particular, the false last door falls quickly and kills you if you do not get out of the way. By mentioning Elsa in the EGA version, Yorick disappears. If he doesn't disappear, he trolls you with all kinds of trash that stuns you and pretty much makes everything impossible to do in time. Throw the potion at Elsa and exit the door, which costs me a second because I get stuck for some reasons. Annoying. The reason it is run on version 1.00 is because there is a specific exploit that eliminates having to save the Baronet and allows immediate safe entry into the final area of the game. This knocks off a good two minutes or so which is explained in detail below. Renault's 2007 run was the major inspiration to running this game, and the completion and acceptance of the other categories made me want to finish out the cycle. I was thrilled when I first saw Renault's run, but was disappointed as very few people ever went back to try and improve on it despite it being a fantastic game. After trying to duplicate his attempt, I realized his keyboard skills far outpaced my own and shelved the idea for the VGA version. Once the VGA runs were done, it was a matter of taking what I had learned and applying it to the earlier version, as there were a number of optimizations discovered. Running the VGA version and routing that one adjusting the route for this EGA version very easy. A little bit of practice getting my keyboard skills where they needed to be for this game, and here we are. The only difference in route is with the Fighter, who does not have enough starting skill points to get both Magic and Climbing. This is easily fixed by spending points on Throwing instead, but that changes the opening route slightly as he cannot climb over the back-alley wall. However, once the Fighter gets some Rocks and easily obtains the Spirea Seed with his 45 Throwing skill, the route merges and becomes identical from there at about the 1:00 to 1:30 mark. The difference in time is likely only about a maximum 20-30 seconds, and might end up being closer to even. The four minute area is pretty dependent on Strength, and since the Fighter has higher Strength, it might end up being even. Even climbing out of the Fort when the game transitions to night requires no Climbing skill. Points allocation in character creation emphasizes magic and throwing. Throwing will be at 45, which is consistent enough for one attempt at the Spirea Seeds. Magic is for the Open spell and the Calm spell. I head out of the front gate of town and get some rocks on the way for the next part. The next obvious difference between the EGA and VGA versions is the use of keyboard for almost all movements. The screens north/south and east/west don't always line up right, so getting caught on bushes is common. It is almost always quickly fixed. It's more difficult with doors, but at least with the doors there isn't the constant threat of RNG encounters with monsters. They are far more frequent in the EGA version, and nearly impossible to avoid when the game speed is turned up to the highest. Luckily, there are no encounters. I reach the plants, throw the rock and knock out the seed and head out. Getting the Flowers and Calm goes straight forward. The next thing is to transition to night. When you type "rest" it only advances 10 minutes at a time. In the VGA version, you have the option to rest for 60 minutes at a time. This makes resting in the EGA version tedious, but also has the unfortunate side-effect of not allowing enough time to pass for night to actually start. Luckily, the stables scene can skipped by simply pressing enter again after saying "yes," and climbing out of the Fort can be done even if the character has no Climbing skill at all, as demonstrated here. I run to the Meeps through the special goblin arena, because that elimiates a few screens for bad RNG encounters. The Meeps give me the fur, the Faeries give me the dust, and I sleep at the Dryad's Tree and get the Acorn. Running straight east, I get the Flying Water and head north and get the Dispel Potion. Fast and uneventful. Once I reach the Antwerp and the secret entrance to the Brigand's Fort, you have to position yourself VERY specifically to find the keyhole. I have no idea why it is so specific, but once you find the keyhole it is a matter of unlocking the door with the Open spell and forcing the door with Strength. You build strength with every attempt and do not lose stamina. The exact strength needed to open the door seems to be RNG affected, either by how much you randomly gain with each attempt or whether or not it actually opens. This was great RNG. This area is dangerous at this high of a game speed. In particular, the false last door falls quickly and kills you if you do not get out of the way. By mentioning Elsa in the EGA version, Yorick disappears. If he doesn't disappear, he trolls you with all kinds of trash that stuns you and pretty much makes everything impossible to do in time. Once you get through the door, the end is pretty much a guarantee. I throw the Dispel Potion. Once I exit through where Yorick was the timer stops. Better controls, but even then, I doubt there will be massive time saves unless there is another glitch that appears. This was pretty much the best RNG I could have hoped for in this scenario. The reason it is run on version 1.00 is because there is a specific exploit that eliminates having to save the Baronet and allows immediate safe entry into the final area of the game. This knocks off a good two minutes or so which is explained in detail below. The dagger glitch that this displays is available in all versions, however. The minotaur is skippable in both VGA and EGA, though through different means. Since the discovery of the dagger-throwing glitch in the Brigand Leader's room, I have been looking for a way (admittedly less frequently) to skip more. When a runner named c-square on the TASVideos.org forums messaged me and told him he was using my route as the base for his TAS of QFG1EGA, I got excited. He discovered that the Calm spell is really just a suggestion, and not necessary at all. To make things even better, the Calm spell imports anyway into Quest for Glory 2 (both EGA and VGA) for some unknown reason, so skipping Calm is now the new official route for the Marathon run. My focus was also on getting the text-parser and Antwerp right, which are just frustrating time sinks. I am extremely pleased with this run. My estimate is 1m 35s. Timing starts when the Sheriff says "Good luck" and ends the moment I hit the door tranisition to escape the Brigand Leader's room. Really, any class can pull this off with the right point allocations, and every class has enough points to make it happen with no grinding. The use of Stealth is new to the route for use at the Minotaur, which allows us to skip him. At 40 Strength the door to the Troll Cave opens without any grinding. Buy the Open Spell and head straight to the Antwerp. If you bounce once into the Antwerp he is then transparent and can be moved through for a few seconds, which allows me to use the mouse to get him into the right position to cast open, move the rock, give the password to the Troll, and enter the cave. This screen with the Antwerp is tricky; not because you can die easily, but because it's VERY particular about the way things need to be for maximum speed. Lining yourself up with the cave door is actually EXTREMELY precise. If you are even a pixel lower or higher from where you need to be, casting Open will say there is no lock. If you move too far away from the door (it's easy to do) after giving the password, the password will not work and the Troll will be there to kill you. The new part is the Minotaur, as stated above. You are able to get to the door and open it and enter before he can attack you, which is amazing to me. The first thing you do, no matter what, is cast Open to get the gate open. Past that, there are two ways get past the Minotaur. 1. You can move forward from the bush just slightly but stay within the bushes. This will make the bushes rustle and alert the Minotaur, but the Minotaur will not see you because you are still concealed. You then get a few seconds of free actions outside of the bush to open the door and get inside. 2. You can use Stealth in a very particular way. If you use Stealth and move up (I'm guessing it's MAYBE 1 pixel because it doesn't look like you've moved at all, but who knows), you can move out of the bush quickly, open the door and get inside without the dialog from the Minotaur. I find this to be easier to manage in the time frame. From what c-square tells me that in TAS format, it takes 400 milliseconds to type "sneak" and then move up, but that it takes 128ms to hit the bush and have the minotaur check around. Technically speaking, in the TAS world, doing the first method is ultimately faster. However, he is also using the Hero's Quest "Hi-Speed Hero" mode, which is a 1.00 exclusive option and for a RTA is utterly uncontrollable. Even in a TAS Hi-Speed Hero mode is turned on and off quickly because some screen transitions do not happen (like getting to the magic shop or the the troll cave) while it is turned on. Without the use of "Hi-Speed Hero" mode and with normal human limitations, I have VERY strong evidence to believe the Sneak method is the fastest for a RTA. Since I am already sneaking, I take advantage of the extra control I have to move through the room with more precision. When running, the hero moves so fast that it is impossible to stop him in front of the last trip wire to "step" over the rope. Plus, this involves typing "run" through the parser which takes time and then navigating through the room. I did quite a few tests. It seem like there is more time to be saved here, but it won't be as much as could be expected. It may be possible to save one-two seconds max here, but would require extremely fine control work to make it happen. That being said, a new discovery certainly makes this area faster, but again, I am convinced it is beyond human ability because of the perfect movement required to make it happen. Moving diagonally across the trip wires does not make the hero trip for some reason. In the TAS, with perfect control, this room takes LITERALLY one second; you blink, and it's gone. The cafeteria is straight forward, but time saving opportunities in here are coming down to keystrokes through the parser. I could save time by typing "bar door" instead of "close door", but it is only two-keystrokes. The same could be done with "move chair" changing to "move candle" Instead of typing out, "move candle," I could hit SPACE or F3 to bring up the last command, backspace to "move c" and then type "andle," but the difference is a one keystroke time save. In Yorick's Maze, you can cast any spell to get Yorick to flee the room. The old method of asking Elsa has Yorick talk to you about breaking the enchantment before he flees the room, so this saves a few boxes of dialog. "Zap" has the least number of characters of any spell in the game, and only the Magic-User has this spell. The rest of the room goes smoothly and quickly. In the leader's room is the game-breaker glitch. Instead of throwing the Dispel Potion, you have to "throw dagger," which aims at some random, unknown target and unlocks movement for you character. The HAREST part of the game is now lining yourself up with the exit. The diagonal movements make this a bit more consistent, but it is still difficult. If you do not go fast enough, the scene changes to Elsa and you will die. Interestingly enough, this can only be done on MAX speed. I experimented with trying to grab Baba Yaga's mirror and then exiting, but I am fairly certain that this is impossible even in a tool-assisted run. You can grab the mirror, which is neat, but that would result in you being able to defeat Baba Yaga without saving the Baroness or Baronet (which should be impossible). When I slowed the timer down to attempt getting both, which usually increases accuracy, the scene changes immediately after throwing the dagger to Elsa and you die. At MAX speed, you get a few seconds of movement, and enough to escape and trigger the win screen. The same is true with the Minotaur screen above; it is skippable at max speed, otherwise you get into a fight.